I've been pretty checked out of second-world fantasy lately. I'm continuing with the series that I've started, but have felt little urge to start new ones. This happens periodically; fantasy is incredibly predictable, even for genre, and typically requires a massive page commitment to see a story through to the conclusion. So the idea of embarking on another 500,000 word quest to another restoration of the status quo is just...not that appealing right now. In all honestly, it's been a couple years since I was really excited about a new series. That changed last November, when Brian G. Turner contacted me about reviewing his self-published debut novel, the first in his Chronicles of Empire series. I've known Turner for some time, as he is the proprietor of SFFChronicles and I have been a part of that community. Over the years the site has evolved the functionality of an online writers' workshop for its users, many of whom are published or aspiring authors. In that capacity, I have observed Turner posting sections of his work-in-progress, engaging in conversations on the craft of writing and narration, and posing big questions about fantasy tropes and conventions, good and bad. Knowing first-hand how deeply Turner has thought about this project, I was quite keen to see how the finished product turned out. What I found is a highly enjoyable but somewhat uneven book--a roughhewn tale that could use some polish, but which also breaks the narrative mold in ways that feel fresh and exciting. As such, you could say that Gathering encapsulates both the promise and problematics of self-publishing. 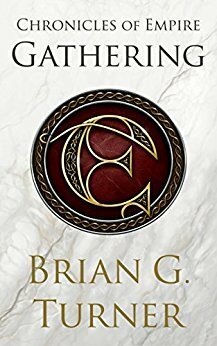 Gathering is the story of a motley group of companions gathered by the empath Jerine, who is contracted by Councilor Amberlin of Corianth (i.e. the Imperial capital) to investigate odd comings and goings in the city. In that capacity, Jerine's band stumbles upon warehouses packed with mysterious explosives. This, in turn, illuminates a series of interlocking conspiracies: to return an exiled religious figure, to topple the Empire and to alter the future by meddling in past (i.e. present) events. The time travel story marks Gathering, like Gene Wolfe's Book of the New Sun, as an SF/fantasy mashup--a story that adopts the superficial guise of fantasy, but in which everything can be explained by some form of science or technology. The device works well, and feels natural to the world Turner has created. Gathering is also notable for tying an epic story to the narrow scope and slow pace more commonly associated with sword & sorcery. In fact, Gathering is even narrower in scope, slower in pace and more keenly character-focused than most S&S. All of the companions--empath Jerine, her martial artist sister Tillerine, thief Sirath, barbarian Ulric, blacksmith Dalatos, cleric Erin and futureman Ezekiel--get their own perspective chapters, and by the end of the book we know them quite well. This, by itself, is not remarkable; but the fact that so little time elapses during the first third of the book, which is almost entirely set in an inn over the course of 24 hours, is quite an abrupt change from genre norms. Some might be turned off by this idea, but to me it was intriguingly different. Plus it's a fairly common approach in other genres and media, so why not fantasy? Turner also plays with expectations for these characters. Ulric, the barbarian, hates violence. Dalathos, the rough-hewn blacksmith, is commonly (one might say bizarrely) mistaken for an aristocrat. * Sirath and Jerine, who at first seem like polar opposites on the scale of morality and ethics, develop an unexpectedly tender relationship that feels intuitive. And in general, all the companions are sympathetic and relatable. By the end of the book, I was deeply invested in what happens to them. All of this gives Gathering a distinctive feel that contrasts with the standard form of traditionally-published fantasy. I suspect that, because of this, Gathering would have struggled to get past the gatekeepers at most literary agencies and imprints. But by breaking with genre conventions on how narrative is structured, Gathering reminded me that fantasy can still be surprising and unpredictable. This is the promise of self-publishing, and a major reason why it has caught on with readers. There are other notable aspects of Gathering. The action scenes are all very well done, capturing the surreal confusion of violent events in vivid color. And the world of Gathering is well rendered. I particularly liked the political map of Corianth. It is ostensibly ruled by an Emperor, but in reality there is a carefully maintained but inherently unstable balance between several competing factions, each with their own means of violence. Nevertheless, Gathering still feels like it would have benefitted from the longer and more systematized editorial process that traditional publishing provides. There are too many changes of perspective in the first third of the book, making it difficult to keep all the characters straight and inhibiting flow. Among the companions, I thought that the Sirath, Tillerine and Ezekiel chapters were strongest, and the Erin and Ulric chapters weakest. Actually, I could have done without the Erin chapters altogether, as I found they distracted from the main plot points; more than once I wondered if they might have worked better if integrated into other characters' perspective chapters. There are also maybe 5 or 6 non-companion characters who get their own perspective chapters, but really only Rodrigan and Molric (i.e. the big bads) are essential. There's nothing wrong with the others, per se--some, standing on their own, are quite good. It's just that the sheer number of perspective characters created some reading fatigue issues for me. I would have preferred pruning the number by about a quarter to a third. Similarly, despite the potential described above, the political intrigue storyline never quite gelled for me, and would have benefitted from more exposition of the allegiances and alliances, which are vital to understanding the implications of events, but often feel obscure to the reader. And there are several plot twists, related to this storyline, that feel unintuitive and out of the blue given what has been revealed. As such, this is another area where Gathering could have benefitted from structural simplification, as well as better pacing in terms of how information is delivered to the reader. In the end, though, none of this detracted from my enjoyment of Gathering. It's a really fun book that feels fresh in many ways, and features great characters in a compelling world. And it passes the ultimate test for the opener in a fantasy novel: were it already available, I would have immediately started the sequel! *This does strain believability at times, like when actual aristocrats fall for the ruse. But mostly it works, and sets up some neat plot points. Penalties: -1 for ...but there are too many of them with perspective chapters; -1 for ...and the pacing doesn't work as well on the political intrigue storyline as elsewhere. Nerd Coefficient: 7/10. "An enjoyable experience."